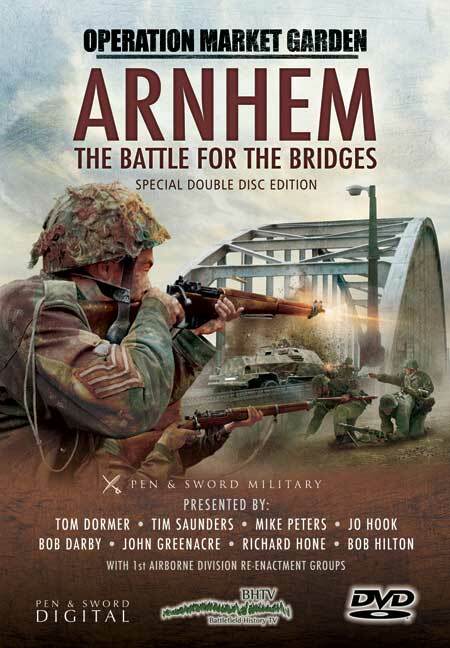 You'll be £19.99 closer to your next £10.00 credit when you purchase Arnhem - The Battle for the Bridges. What's this? The Battle of Arnhem, fought in the early autumn of 1944, remains without a doubt the most hotly debated battle of the North West European Campaign, both then and now. From its inception in the sixteen canceled airborne operations during August, we will chart the problems, many of which were ignored by men desperate to get into battle, the compromises and mistakes that pitched lightly armed and ill equipped paratroopers and glider infantry into an unequal struggle against an SS panzer troops. We follow the eight mile route that 2 Para took to reach the bridge at Arnhem, slipping through the German defences. The Market Garden Collection will continue in Arnhem –Battle of the Woods out later this year. This is an extremely well-packed two hours with contributions form well-known historians. This is a very interesting and well-balanced account of this major operation from World War II which has been superbly condensed to DVD. Absolutely recommended. This twin DVD set covers the Garden component of Operation Market Garden. Experts on the battle assist the presenters who are themselves former soldiers and military historians to cut through the myths and bring fresh insights to this epic combat of WWII. An absorbing and inspiring story of great courage and tenacity that is not to be missed. The most insightful and engaging sections of the DVD are the interviews with the veterans of the campaign, who speak openly and candidly about their experiences in France and Holland in 1944. There can be no underestimating the value of these men’s accounts and opinions, and this is what the DVD delivers particularly well. I have read several of the best known books on the battle, but have never been there, It is an omission I often feel needed to be remedied. This film has achieved the inevitable and makes me want to go today. Part of a series of films examining various aspects of Operation Market Garden, this superb DVD follows the efforts of the 1st Parachute Brigade to reach Arnhem Bridge and the famous battle fought to defend it. There have been any number of documentaries which have chosen this same and perhaps overly familiar subject, yet this one is in a league far above them as it devotes two hours to this one aspect of the battle and as such is packed with detail. Coupled with interviews of veterans and the insights of a group of highly knowledgeable historians, who walk the ground around Arnhem and explain each phase of the battle as it unfolded, the result is a most authoritative account that will not disappoint even those who have a very thorough understanding of the battle.